Using a technicolor palette, Noé Jimenez’ work creates layered connections ranging from pop culture references to pure abstraction. 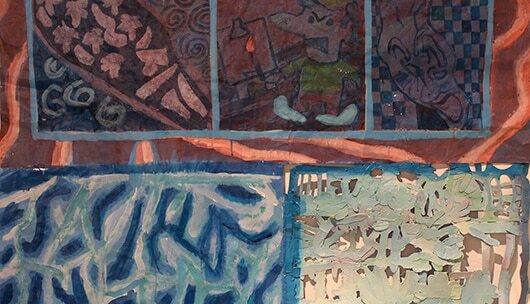 Organic compositions within his small paintings are then mimicked through his clustered installation on the wall. Alongside collage, the physicality of his painting fully exploits the fluid and viscous nature of his materials. Noe Jimenez lives and works in West River Arts Studios in Westville, CT. He graduated with a BFA in Painting from Paier College of Art in 2012, and has studied painting at Colegio de España, Salamanca, Spain, University of Urbino, Italy and Altos De Chavon, Dominican Republic. In 2014 he was a resident at Norðanbál on Hrisey Island in Iceland. His work has been included in solo and group shows in Connecticut, California, Rhode Island, New York, Massachusetts, and private collections. You can see more of his work by visiting his website or his Instagram.